2700 South Main Burlington, Iowa September 14, 1947 Dear Officers of Burlington Organizations, On the afternoon of Thursday, September 11, representatives of some twelve organizations met to discuss Atomic Energy Week, a community project for Burlington, proposed by the League of Women Voters. Because a representative of your group was not present either due to inability to attend or failure on the part of the League to get in touch with you, we are sending you the enclosed summary of the meeting. This will give you the necessary facts for action on the matter should your board or executive committee meet before the next joint meeting of Burlington organizations at the home of Mr. and Mr. J. C. Pryor, 4 P.M., Monday September 22. Whether or not official action by your organizations has been taken by this date, we urge you to send a representative to the meeting. 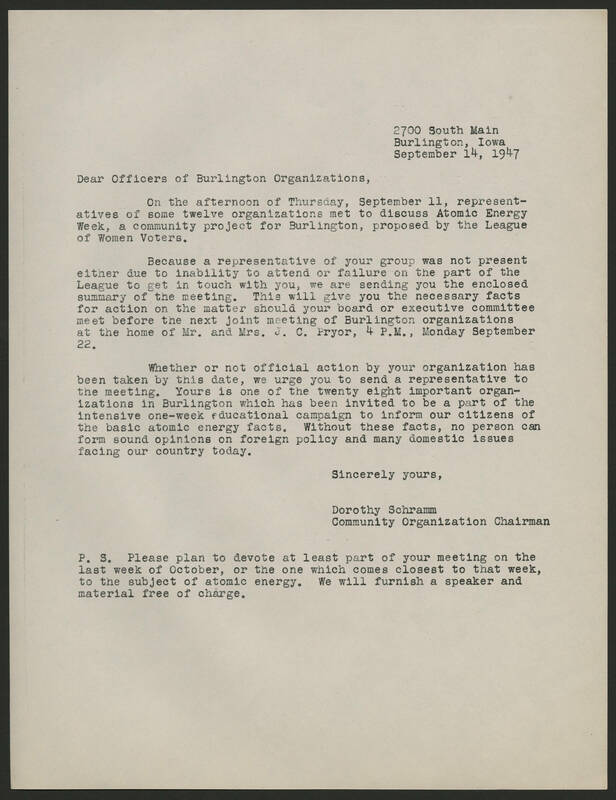 Yours is one of the twenty eight important organizations in Burlington which has been invited to be a part of the intensive one-week educational campaign to inform our citizens of the basic atomic energy facts. Without these facts, no person can form sound opinions on foreign policy and many domestic issues facing our country today. Sincerely yours, Dorothy Schramm Community Organization Chairman P.S. Please plan to devote at least part of your meeting on the last week of October, or the one which comes closest to that week, to the subject of atomic energy. We will furnish a speaker and material free of charge.